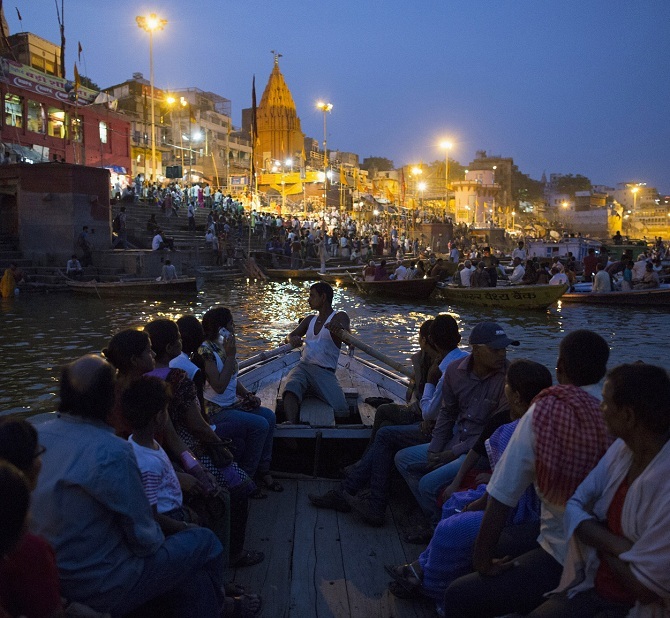 N Sundaresha Subramanian explains the challenges authorities face in cleaning the Ganga and other holy rivers in Varanasi. On an e-rickshaw on the road to Banaras Hindu University, Alka, a third-year student, is all praise for Prime Minister Narendra Modi. A first-time voter, she thinks Modi is a doer. "Just go to Assi Ghat and see for yourself. The place is completely unrecognisable. It is so clean, and cultural events are held every day," she says. Assi Ghat is the southernmost of the 84 ghats along the Ganga that form the core of Varanasi. The ghat gets its name from its location at the confluence of Ganga and Assi, a tributary. Cleaning the ghat might have been easy, cleaning the Assi river is a different matter altogether. "Encroachments made the river a canal, now it is no more than a drain," said Motichand Mishra, assistant registrar, sanitary and support services, BHU. Mishra is not off the mark. A few hundred metres from the face-lifted Assi Ghat, the water is black, with a greenish tinge. The stink is unbearable, but the buffaloes and dwellers seem to have become inured to it. What flows today in Assi is untreated sewage, says Sanjay Kumar Singh, general manager, Ganga pollution prevention unit, Uttar Pradesh Jal Nigam. Varanasi generates about 300 million litres (MLD) of sewage every day. It has three functioning sewage treatment plants. Together, these have a combined capacity of 101 MLD. "We are able to treat only a third of the sewage. The rest goes untreated into the Assi and its northern cousin Varuna (Varanasi derives its name from these two rivers) and eventually flows into the Ganga," Singh adds. Ram Gopal Mohley, the mayor of Varanasi who belongs to the Bharatiya Janata Party, says the election of Modi from the constituency has changed the face of the city and more is expected to change now that the Uttar Pradesh assembly election results are out. "The public is ready for improvement. And they do not mind paying for it. But somewhere we are not able to provide the service," he adds. Mohley blames the state government. “The sewer lines in the city are over 100 years old. These are being cleaned only after the Modi government assumed office. But the implementation is by the state government," he says. Egged on by the Centre, the Varanasi Nagar Nigam under Mohley has brought in reputed players to clean the city. People who work in these projects say the prime minister’s office is directly monitoring many of them. Fortnightly reports are sent from their end, but frequent changes in officials in the ministries concerned affect continuity. While there is a feeling that money being spent is not reflecting on the ground (and water), some contractors say their payments are not regular. Thousands of pilgrims, including foreigners, visit the city every year. Many of them come with the belief that a dip in the Ganga will relieve them of their ills. "Today, a dip in the Ganga can only give you disease. The monsoon water has long dried up. What you see now is mostly sewer from the city," says Mishra. Pilgrims add to the pollution by throwing puja articles and flowers into the river and washing clothes in it. With 120 festival days a year this is a significant source of pollution. In addition, there is waste from the two cremation ghats, Harish Chandra and Manikarnika. It is a religious belief here that the fire at these ghats must never die, so cremation goes on round the clock. It is not uncommon to see locals bringing buffaloes for a bath in one of the main ghats. Unauthorised colonies that have come up along the bank of the river have no option but to discharge their garbage into it. The greater challenges, though is the fight against beliefs. S K Majumdar, a trade unionist, says, "People believe they will go to heaven if they are burnt on wood. The two electric crematoria at the Harish Chandra Ghat are sparsely used." There are also entrenched interests around these practices, which need to be provided alternatives. It is not easy to miss the uniformed staff, stainless steel dustbins and banners calling for Swachh Varanasi and somewhere on these lie the embossed the logo of IL&FS Environment. A fully owned subsidiary of the infrastructure giant Infrastructure Leasing & Financial Services, Delhi-based IL&FS Environmental Infrastructure and Services last May signed a tripartite agreement with Union ministry of urban development and Varanasi Nagar Nigam to provide door-to-door garbage collection and street cleaning services for 14 of the 90 wards of the city. These 14 wards border the ghats, are densely populated and receive a significant amount of floating population. With its experience in managing similar areas elsewhere, IL&FS has been able to bring much-needed professionalism and an end-to-end approach to the waste collection system in what is known as the ‘Pucca Mahal’ area. Of the 550 tonnes of waste generated in the city per day, 55-60 tonnes are generated in Pucca Mahal, according to IL&FS estimates. Another 6-8 tonnes are generated in the 84 ghats. IL&FS has also won a separate contract to clean up the ghats under the Namami Gange plan of the central government. Apart from the dustbins and routine cleaning, the firm has deployed pump sets through which river water is used to clean the ghats. The company has a manpower of about 750 people and has started sweeping streets at night. Door-to-door garbage collection, cleaning of small drains and waste transportation come under its purview. IL&FS executives said they had deployed 31 autorickshaws, three compactors, two static compactors, three excavators and 500-odd small vehicles such as wheel barrows and dumpers. All the garbage is brought to the centralised point in Shivala and moved to the processing plant in Karsada in the outskirts, where it is converted into compost. Two other companies, Kiyana Solutions and Ecopal Services, have taken up cleaning of other wards of Varanasi. Mishra of BHU said a similar plan to outsource the cleaning services for the 1,300 acre campus was being discussed by the university. He is miffed that his sanitary and support services department has not received a single rupee under the Swachh Bharat Mission though he has been driving the campaign in the campus with existing resources. The existing plants in Divanpur, Bhagwanpur and Diesel Locomotive Works are compliant with effluent norms that date back to 1990s. Modernising these could be more expensive than putting up new ones. Therefore, two new sewage treatment plants are coming up. Larsen & Toubro and VA Tech Wabag are building these plants, which have capacities of 120 MLD and 140 MLD, respectively. While the former is a Rs 119-crore project taken up under the Jawaharlal Nehru National Urban Renewal Mission, Namami Gange, or the Clean Ganga Mission, is funding the second project costing Rs 171 crore. The Uttar Pradesh Jal Nigam is conducting a tender process through which another 50 MLD unit will be built in a nearby village called Ramana. "The units under construction are expected to be ready by the end of 2018. And, by 2019, with a total treatment capacity of 411.8 MLD, we will be able to safely say that no untreated sewage is entering the Ganga at Varanasi," Singh adds. That will be the time when Modi will have to come asking for votes again. MAGE: Devotees travel past the ghats of Varanasi. Photograph: Danish Siddiqui/Reuters. Why is Modi talking about Temsutula Imsong? Dear PM Modi, will you support this girl?